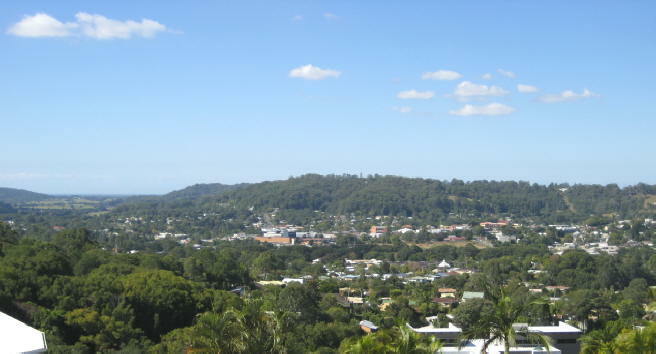 Nambour is a town of about 14 000 people, and is located about 100 kilometres north of Brisbane, Queensland, Australia. It is half-an-hour's drive west of the splendid Sunshine Coast sandy beaches of Mooloolaba, Maroochydore, Mudjimba, Coolum and Noosa. In this hinterland area, sugar cane growing was an important farming activity from the beginning, and lasted more than a century. The 2003 closure and subsequent demolition of the Moreton Sugar Mill at Nambour virtually ended this industry, although cane can still be seen growing in the district. Over the years, local farms have produced many different crops, in particular, oranges, bananas, pineapples, strawberries, ginger and vegetables. Nowadays, fruit-growers are concentrating on strawberries and pineapples, with some branching out into grapes, lychees and more exotic fruit. Dairy cattle and beef cattle are also common around Nambour, but their numbers are falling. The town is growing, and the area between it and the Pacific Coast is rapidly becoming urbanised. What were the coastal tea-tree swamps of less than 50 years ago are now expensive housing estates built around networks of canals with sea access. The population of the area is swelling, with people from the southern states and New Zealand moving to the area to escape the colder winters down south. Farms are becoming subdivided, and the blocks sold off as rural residential acreage, where city folk aspiring to a country lifestyle build spacious dwellings with many of the accoutrements of an urban mansion. This means that the agricultural nature of the district is gradually disappearing, although the local government policies are that the erstwhile cane farms and other prime farming land should not be subdivided. A population cap is also under consideration. Light industry, commerce, local government, education and services are major activities in the coastal strip, and this development is now reaching Nambour, which prides itself as being the 'hub of the hinterland'. Always the base for the Maroochy Shire Council, it is expected to remain an important centre for the Sunshine Coast Regional Council that replaced the Maroochy Council in 2008. The photographs below show how the area has been progressing in the last 70 years. Whereas the first settlers made removal of the trees and scrub their main priority, later generations have encouraged the regrowth of native flora, leading to the cool and green aspect of the Nambour district that is illustrated in the last three photographs. 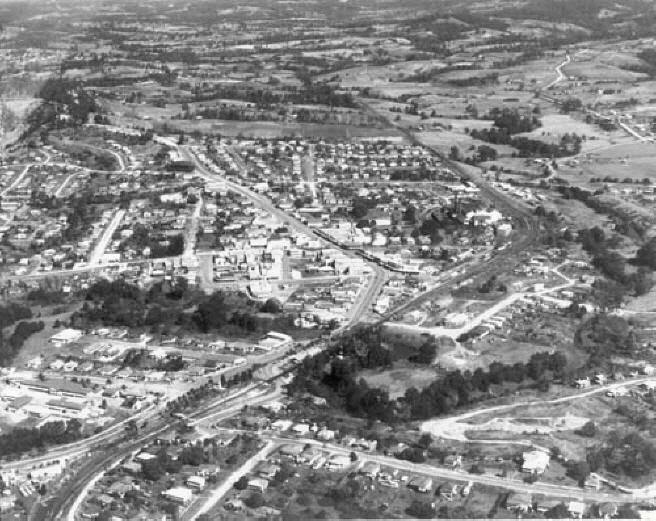 Aerial view of Nambour from 12 700 feet on 8th July, 1940. North is at the top. Nambour Hospital is at the upper left margin. Used with permission from Geoscience Australia, owner of the copyright. 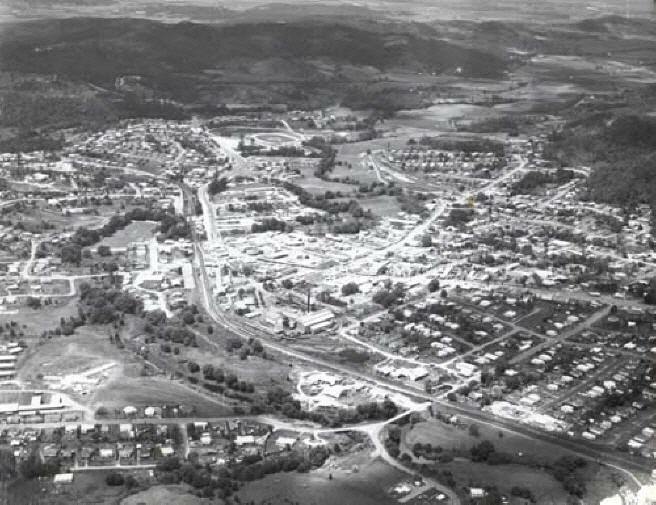 Aerial view of Nambour from 12 700 feet on 8th July, 1940. Close-up of the town area. 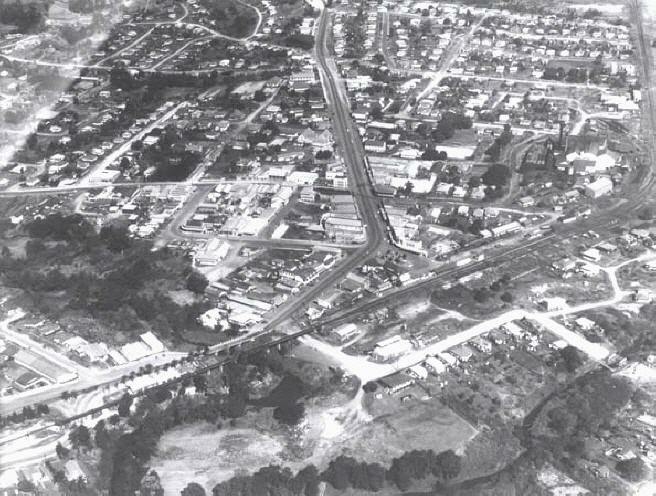 Just left of the centre of the image is the Currie Street - Howard Street intersection. The Arundell Avenue - Currie Street intersection is at the centre of the bottom margin. The Nambour Rural School (now the Nambour High School) and its grounds are at upper right. Used with permission from Geoscience Australia, owner of the copyright. Aerial view of Nambour from 12 700 feet on 8th July, 1940. Close-up of the town area. Top centre: Price Street underpass. Bottom right: Maud Street - Sydney Street intersection. Lower left: Moreton Central Sugar Mill. Centre: Chadwick Chambers. Used with permission from Geoscience Australia, owner of the copyright. 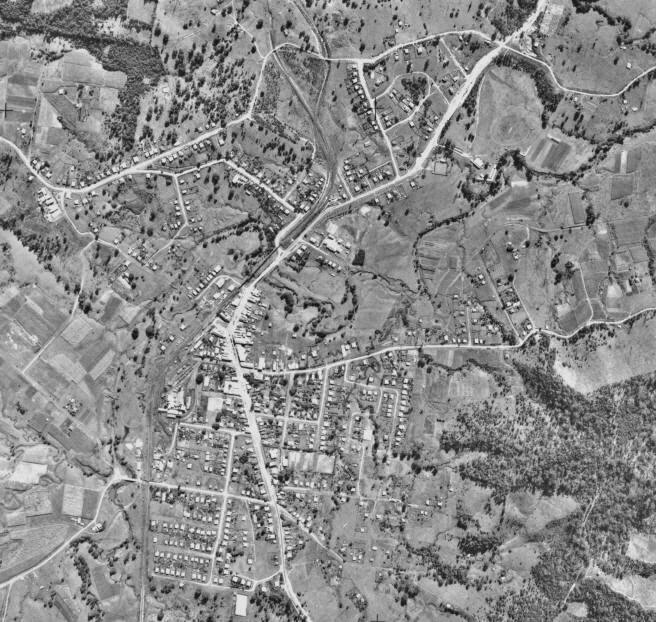 Aerial view of Nambour from 12 700 feet on 8th July, 1940. Close-up of the town area - see identifications below. 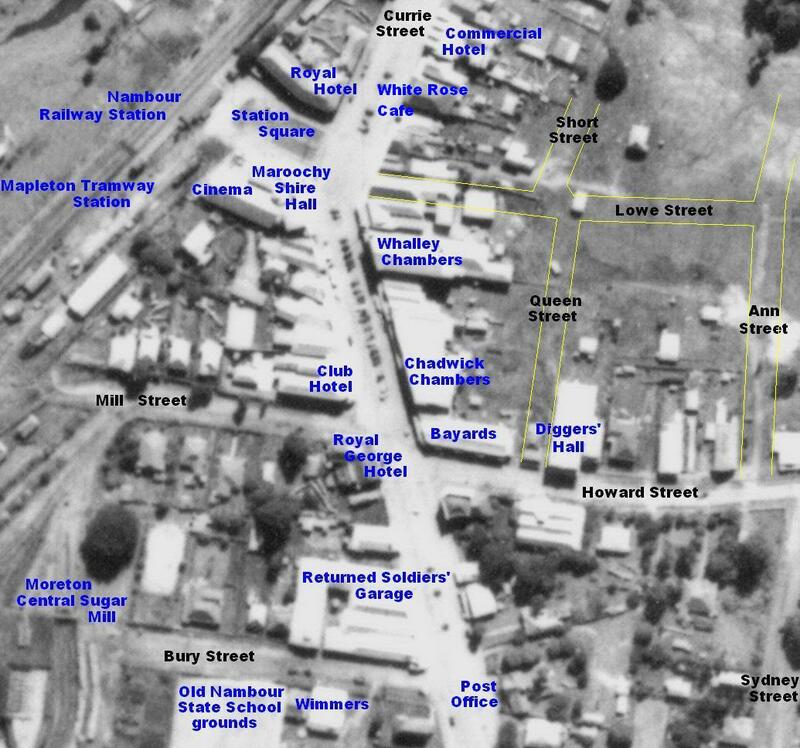 Click here for a map of the central business district of Nambour, circa 1940. Looking south in early 1960. Petrie Creek meanders to the left across the bottom of the image. The main business precinct of Currie Street is at centre. The intersection between Blackall Terrace, Coronation Avenue and Mathew Street is at lower left. The Moreton Central Sugar Mill is at the right margin, just above centre. The junction of Arundell Avenue with Currie Street is just below top centre. Howard Street heads east, meeting the left margin just above centre. Looking south in early 1960 (closer view). Station Square and the Maroochy Shire Hall are just right of centre. Petrie Creek with its road and railway bridges is at lower left. The intersection of Currie Street with Lowe Street is at exact centre. Sydney Street is at upper left, Price Street at lower right. Below top centre is the Currie Street - Howard Street intersection. Looking south in early 1960 (much closer view). The intersection of Currie Street with Lowe Street is below centre. On the western (right-hand) side of this intersection is a small park known as Station Square, as it leads to the Nambour Railway Station. Facing each other across the Square are the Royal Hotel (on near side of the Square, with dark coloured galvanised iron roof), and the imposing Maroochy Shire Hall (with Ionic and Doric columns, on far side of square. Work on the new Maroochy Shire Hall auditorium, completed in August that year, is under way, with the steel uprights on both sides in position. 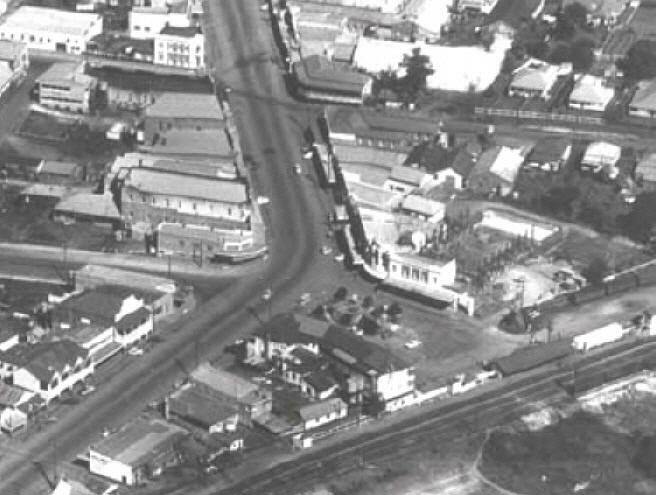 Below top centre is the Currie Street - Howard Street intersection, with the sugar tramline showing as a dark line crossing Currie Street. The Royal George Hotel is on the south-west (upper right) corner of this intersection. The Royal Hotel and the Royal George Hotel both burned down in 1961. The Maroochy Shire Hall was lost to fire in 1986. Looking south-west in 1963. Blackall Terrace is in the foreground. William Whalley's large residence 'Stoneleigh' can be seen on the far side of Blackall Terrace, a short distance from the lower right corner of the image. Coes Creek Road heads towards the upper right corner. Nambour State High School is at the lower left margin. William Street is the light-coloured road running south near the centre of the left margin. Prominent lines of trees define the banks of Petrie Creek. Looking north-east in 1963. Carter Road runs from the left margin across the foreground, meeting Perwillowen Road and Arundell Avenue near the centre bottom margin. Coronation Avenue heads away from the camera, past the Showgrounds with its circular ring. 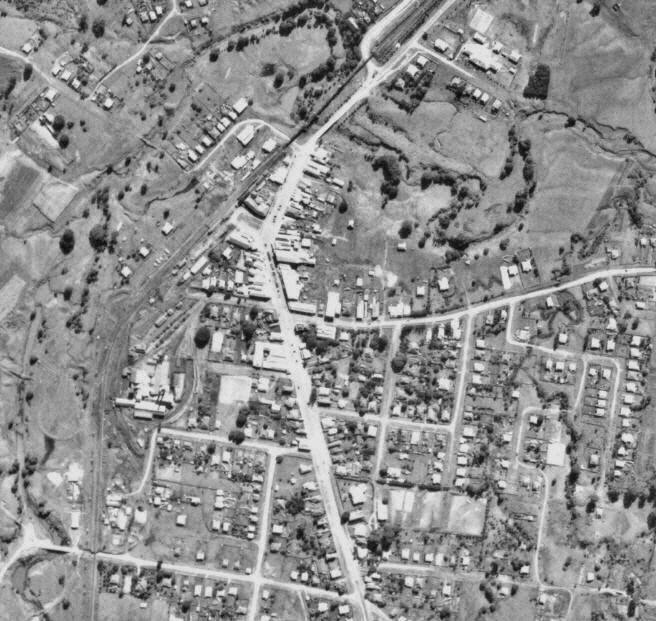 The railway runs from the lower right corner diagonally across the image, passing the Moreton Central Sugar Mill on a sweeping curve to reach the Nambour Railway Station. It then continues directly away from the camera, parallel to Coronation Avenue, before swinging left. Currie Street runs across the centre of the image from the right margin, to become Coronation Avenue after it crosses Petrie Creek. Howard Street heads off towards the upper right-hand corner, down the Petrie Creek valley to the coast. Looking east in 1966. The Nambour Railway Station, the railway line and the Moreton Central Sugar Mill are in the foreground. The central business district is left of centre. Currie Street runs more or less horizontally across the image. Howard Street runs from the Currie Street intersection (left of centre) away from the camera down Petrie Creek valley to the coast. The Pacific Ocean, with its famous North Coast beaches (to be officially named the 'Sunshine Coast' the following year), is in the background. Looking south in 1982. The Currie Street - Howard Street intersection is just left of centre. The Moreton Sugar Mill with its tall, black chimney stack with a yellow band near the top is at centre right. Petrie Park is at lower left. The ill-fated Maroochy Shire Hall is at lower centre at the bend in Currie Street, with its auditorium behind. The Maroochy Council Chambers (opened in 1978) is the square building on piers just above the centre of the image. 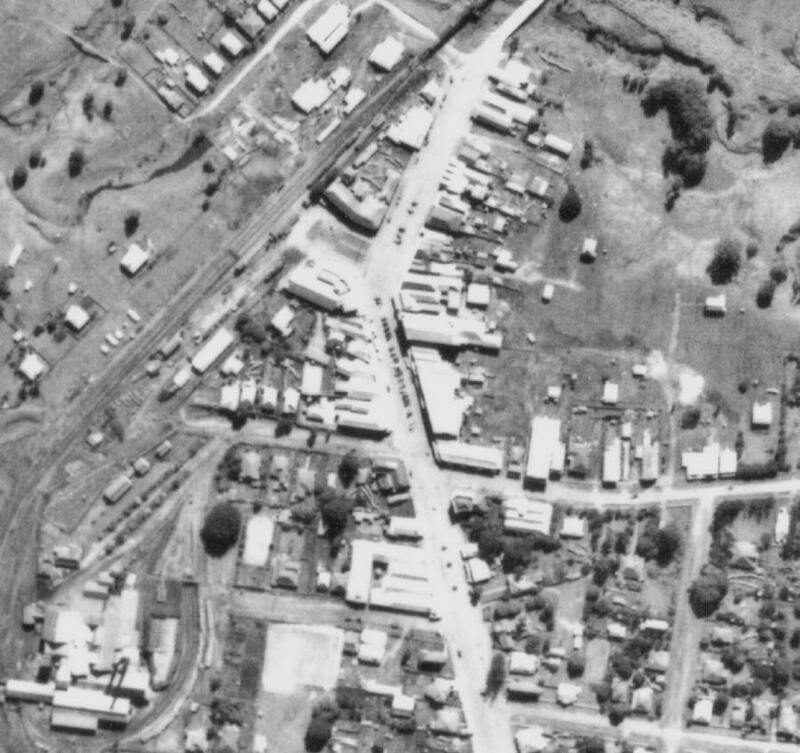 Currie Street runs vertically through the image, in the distance becoming sinuous and renamed Lamington Terrace, then the Bruce Highway, heading towards Brisbane. 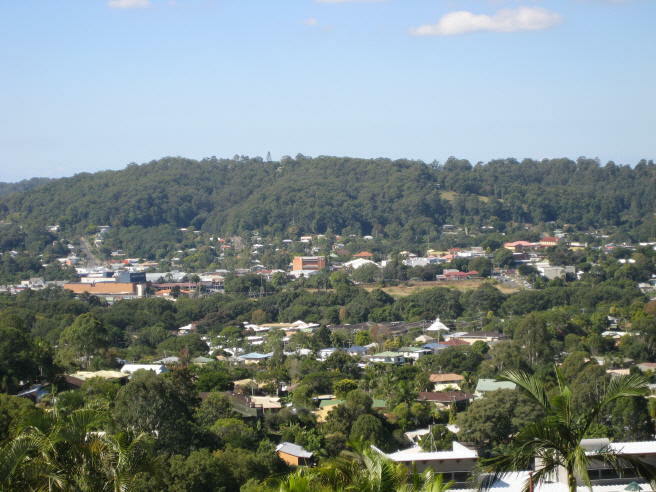 The view east over Nambour's central business district and down the Petrie Creek valley to the sea at Mudjimba, from Albatross Avenue. A closer view over Nambour's central business district from Albatross Avenue. 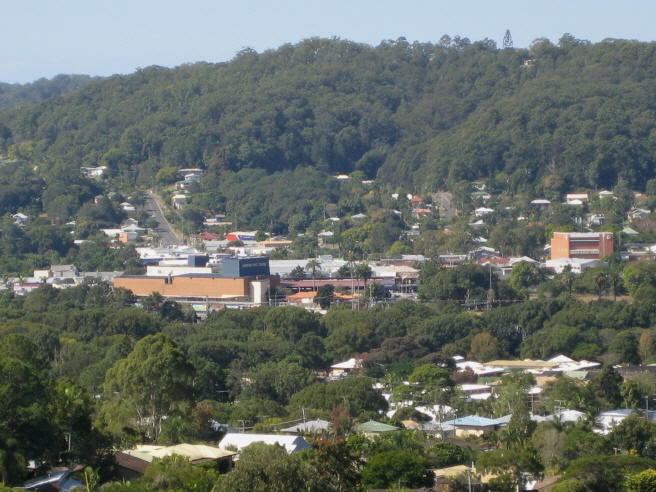 A still closer view over Nambour's central business district, with the Nambour Civic Centre dominating the scene at left centre. 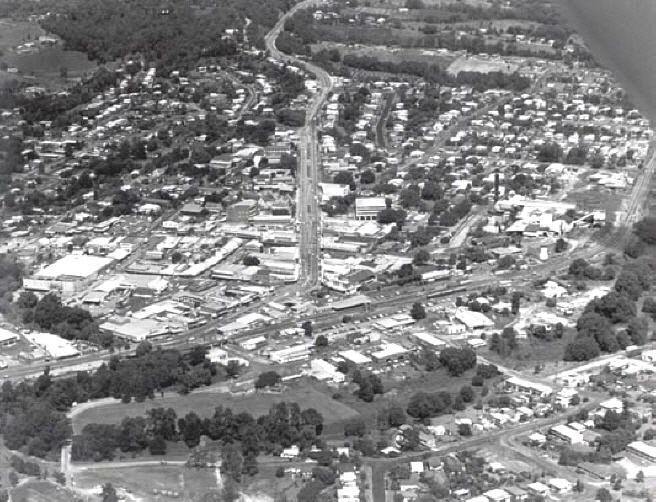 Nambour was first settled in the late 1870s and the first 50 years saw rapid development which continues to this day. The early pioneers and citizens of the little town have left us some fascinating stories. Some of them are recounted in the pages that follow. The reader may be familiar with the freeware program Google Earth™. This provides satellite images of most parts of the world for downloading. A Broadband connection is required. The images can be panned, tilted, scrolled, zoomed and saved. 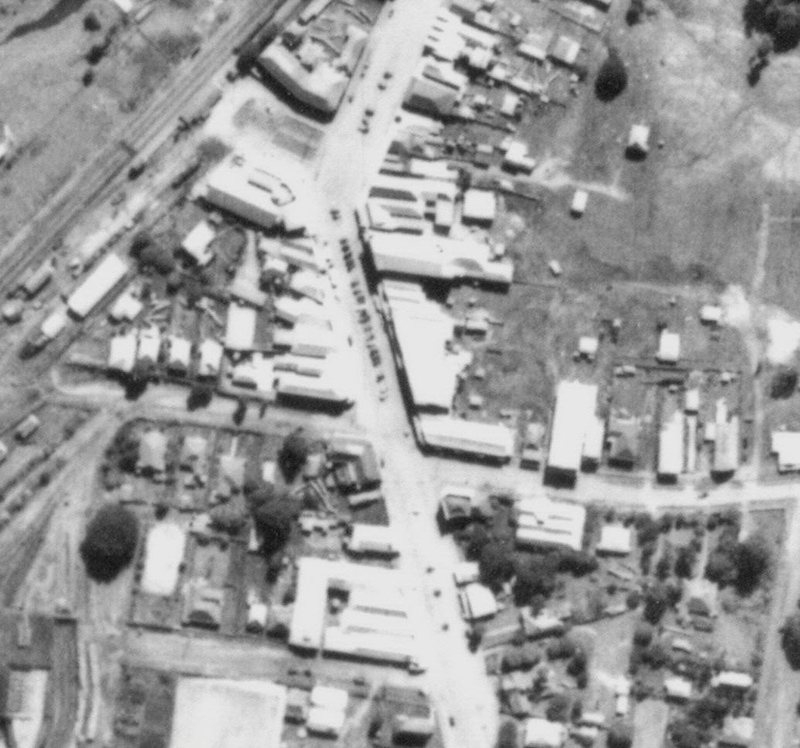 Recently, some of the images of the Nambour area have had their resolution improved, so that objects smaller than half a metre can be discerned. The date of the imagery appears to be early to mid-2007. Many parts of the town and surrounding country can be examined in minute detail. The Google Earth™ images include a mouse-controlled cursor, the latitude and longitude of which are shown at the bottom left of the image. To find Nambour, first locate Australia on the world globe, then Nambour Railway Station at latitude 26° 37' 31.80" South, longitude 152° 57' 27.44" East. The latest images of the town were taken on May 29, 2011, so are up to date, showing the new estates at Burnside, Highworth and Image Flat. Photographs taken from special cars travelling along district streets and roads provide ground level views of many areas. Google Earth™ is available here for free. Tom Petrie sails up Petrie’s Creek to the site of Nambour with a team of aborigine timber getters. Government surveyors are working in the area, cutting it up into blocks. Gold is discovered at Gympie, the first sugar cane is planted in our area (at Bli Bli). The Queensland State Government builds the North or Gympie Road so that Brisbane people can get to the Gympie gold fields. It passes through the Petrie’s Creek area, along what is now Currie Street. Cobb & Co. starts a stage coach service passing through the area, which is still unsettled. The ‘half-way house’ for Cobb & Co. on the Brisbane to Gympie road is Cobb’s Camp (Woombye) where they build the Nil Desperandum hotel . James Low builds a hotel at Yandina to also cater for stagecoach passengers – the Mooroochie House. Cobb’s Camp and Yandina are the main settlements in the area, not Petrie’s Creek. Loggers move into the area. The first settler in the Petrie's Creek district is 34-year-old Mathew Carroll, who selects 160 acres of land fronting the Gympie Road and bounded by the road to Bli Bli and Petrie's Creek on 31st January 1870. After pitching his tent on land now used by the Nambour Bowling Club, he builds a slab house on top of the hill that now forms part of the Nambour Showgrounds, that became known as Carroll's Hill. William Samwell selects 1625 acres to the west of the Gympie Road on 30th March 1870. He uses this land to run cattle, and names the property 'Namba Station', (or 'Naamba' or 'Nambah'), using the aboriginal word for the flowering trees that are growing in the area. It is likely that the word refers to flame trees (Brachychiton acerifolium), a type of kurrajong, which are still common in the district. 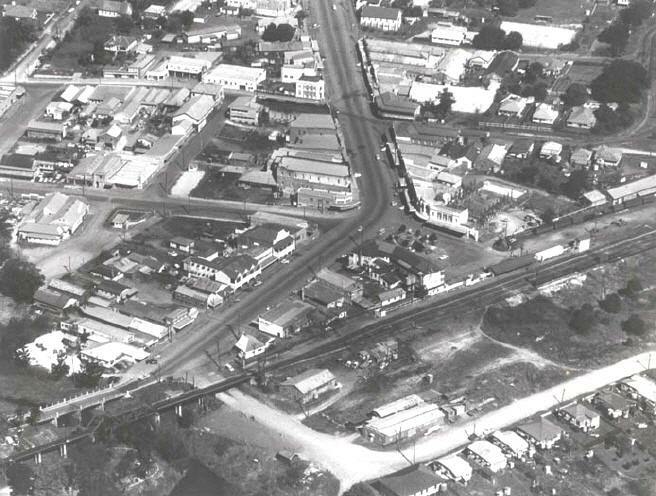 The cattle station is in the area west of what is now Currie Street and includes the area of Nambour Heights. Samwell anglicises the spelling to ‘Nambour’ before 1872. Other settlers arrive (Bury, Howard, Currie, Murtagh, Perren, Whalley, et al). By 1890 there are about 25 people living in the area known as Petrie’s Creek. The North Coast Railway being built north from Brisbane reaches the little settlement of Petrie’s Creek. The Maroochy Divisional Board is created, covering the area from Caboolture to Widgee, near Gympie. A new railway station is opened at Petrie’s Creek, and at that time the settlers have the name of their village changed to Nambour, after Mr Samwell’s cattle run. The Maroochy Divisional Board Hall is erected in Blackall Terrace. Nambour’s population reaches 40. The Nambour Provisional School opens in Mitchell Street. 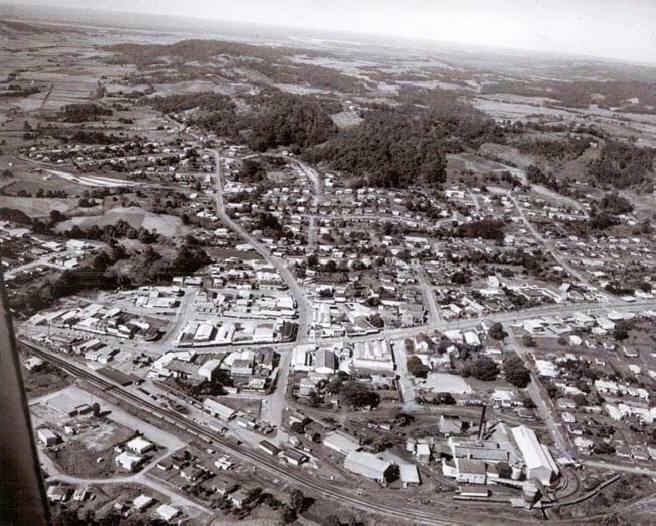 Other settlements such as Montville, Mapleton, Woombye and Yandina also begin in the 1870 to 1890 decades. The Sugar Works Guarantee Act is passed by the Queensland Government, to encourage the building of sugar mills and feeder tramways by providing loan funds to farmers. Sugar is promoted locally as a cash crop by G.L. Bury among others, and a sugar mill planned. Nambour’s population reaches 150. The Moreton Central Sugar Mill opens on 2nd August and attracts many people to the area. The first narrow-gauge tramlines are put down in Mill and Howard Streets to Rosemount, and across Arundell Avenue to Burnside. Nambour's growth outstrips that of Woombye, so the Police Station, Courthouse and the stables are moved from Woombye to Nambour. The Maroochy Divisional Board becomes the Maroochy Shire Council. Nambour’s first newspaper, The Chronicle, is published weekly - the first issue appears on 31st July. The Nambour Post Office is opened. Nambour's first telephone is installed. Nambour’s population reaches 1000. The Mill's tramway becomes a public carrier, transporting people, firewood, mail, livestock and all kinds of freight around the district, to help with the Mill’s shaky finances. Roads in the area are very poor. Nambour telephone exchange is opened. The first wooden Nambour Town Hall and Town Library are opened at the bend in Currie Street. Nambour has its 'baptism of fire', when the Commercial Hotel and several shops burn down in the early hours of 24th May. The Prince of Wales comes to town. He later becomes King Edward VIII of England before abdicating in favour of our present Queen’s father. A major Nambour fire breaks out on the evening of 5th January. 17 businesses are destroyed in Currie Street. AC mains electric power is first made widely available in Nambour, administered and operated by Maroochy Shire Council. (The Mill had previously supplied its own DC electricity to a small number of nearby premises.) The first garbage collection service begins. Some kerbing and channeling is put in. Roads are still dirt and gravel. Another major fire breaks out in the early hours of 26th June. The Diggers' Hall, a boarding house and a fruit cannery are destroyed. A number of businesses, the Town Hall and its cinema, the Town Library and a bank are destroyed by fire on 23rd October. After an unsuccessful experiment with acetylene street lights, electric street lighting is installed in a few main streets. The Maroochy District Hospital (now Nambour General Hospital) is opened. A new, grand Maroochy Shire Hall with Ionic and Doric columns is built on the old Town Hall site at Station Square, and opened on 7th April. The Duke of Gloucester is welcomed to the town on 8th December. In January Currie Street is bitumenised between Bury Street and Petrie Creek to reduce the dust problem. Shop owners have to pay for the footpaths outside their shops to be sealed. The Club Hotel burns down on 2nd January. World War II is at its height. The Battle of the Coral Sea is waged in May, and Townsville is bombed. Three Jap midget submarines enter Sydney Harbour and sink the ferry Kuttabul. The Queensland coast from Rockhampton north is declared a war zone. Military authorities consider the Noosa to Caloundra foreshore to be a logical beachhead for an enemy landing. A great number of soldiers, many returned from Europe and the Middle East, are camped in the area for training. Trenches are dug in all district school grounds in case of air attack. In a disgraceful act of infamy, the hospital ship HMAHS Centaur is sunk by a Jap submarine not 100 miles from Nambour on 14th May, with the loss of 268 lives. The Maroochy Shire Hall in Station Square is severely damaged and many historic records are lost in a fire on 25th April. To reduce the possibility of further disastrous fires, the Nambour/Yandina Fire Brigade Board (now Maroochy Fire Brigade Board) is set up. This introduces paid firemen. Up until 1948 there was only a volunteer fire brigade, the men being summoned by rapid ringing of the Methodist Church bells and loud tooting of the whistle at Lowe’s sawmill. Lowe Street is put in between Currie Street and Ann Street. The historic Alhambra Hall is moved from its 50-year location next to the Royal Hotel, across to the other side of Petrie Creek. Queen Street is surveyed, and put through in the following year. The Diggers' Hall is moved east a few yards to enable the new street to be wider than the narrow lane originally planned. Reticulated water is turned on in Nambour. Previously, people had tank water only, and some wells. The Moreton Sugar Mill used water pumped from Petrie Creek. The Mill had connected a few premises to its supply prior to 1959. Maroochydore is connected to the water supply. The Maroochy Airport is opened. The Royal George Hotel burns down on 15th February. The Royal Hotel burns down on 14th October. A new brick railway station is opened at Nambour. The Commercial Hotel burns down on 9th October. 1967 In August the name "Sunshine Coast" is officially adopted for the area (previously "North Coast"). Nambour Central Plaza is built on the block bounded by Lowe Street, Short Street, Ann Street and Petrie Creek. The centre is refurbished in 2005. Nambour’s first traffic lights are installed. A new Maroochy Shire Chambers (the Eddie de Vere Building) is opened in Nambour. The Returned Servicemen's League (RSL) building is constructed in Mathew Street on the site of an older Diggers' building. Nambour Plaza is built, containing a Woolworths supermarket and 12 specialty shops. The Maroochy Shire Hall is badly damaged by fire on 15th August. Electrification of the Queensland Railways North Coast Line between Nambour and Brisbane is completed in time for Brisbane's Expo 88. Electrification of the Queensland Railways North Coast Line between Nambour and Gympie North is completed. The damaged Maroochy Shire Hall is demolished to make way for a new Civic Hall and Centenary Square building. Nambour thus loses one of its few gracious and notable buildings. The Nambour bypass is opened. This removes much of the heavy Bruce Highway traffic from the Nambour streets. The Moreton Sugar Mill closes and is demolished the following year. Its tramway system is lifted and sold off except for the heritage-listed Howard Street section of in-road track. The Nambour Plaza is redeveloped and greatly enlarged with many more specialty shops and a Big W store. The RSL building in Mathew Street is redeveloped. The Maroochy Shire Council, the Noosa Shire Council and the Caloundra City Council are amalgamated by State Government direction, to form the Sunshine Coast Regional Council. In 2013 the people of Noosa and its hinterland vote to withdraw from the new Council and the Noosa Shire Council is re-established. Nambour Mill Village, a shopping centre built on the site of the Moreton Central Sugar Mill, and boasting the second-largest Coles Supermarket in Queensland, is completed on schedule and opened on Wednesday, 25th September. Three ex-Mill houses have been restored and, with the nearby Nambour Museum, add some heritage atmosphere to the precinct.